Anything goes school of martial arts! Fight enemies, get engaged, and get deciples! Even make your own dojo! History and Personality: 1-2 linesNabiki is presented as the middle of the three Tendo sisters, and a second year student at Furinkan High School. Even at her young age, she is gifted at methodically serving her own interests at the expense of anyone else, including her family, and has no compunctions against emotionally wrecking, manipulating, tormenting, impoverishing or setting up others in life-threatening situations for either money, amusement or petty pride, even if she owes them her life several times over. 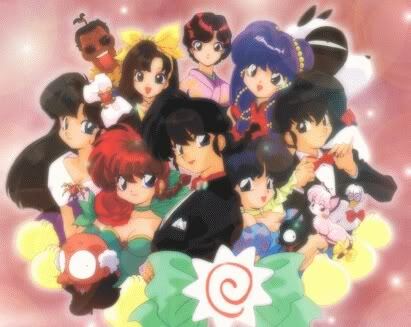 She encouraged Kuno to keep his infatuation with female Ranma and Akane to further her regular sales of clandestinely-taken photos, which he keeps in a large album. She also regularly uses incrimination or blackmail to get what she wants. In the anime she has also taken bets on Ranma's fights. Not much is known about her background, beyond that her mother died when Nabiki was quite young, leaving a very infrequent, but deep longing for a chance to see and speak to her again, but she usually embraces an upbeat, life-embracing, devil-may-care attitude. It is also known that she used to fight a lot with her 1-year younger sister Akane while growing up, and occasionally uses Kasumi as a personal confidante. She doesn't appear to have much respect for her father, and has apparently known Tatewaki Kuno long enough for both to be sufficiently well-acquainted to detest each other, even right at the start of the series. While she comes from a martial arts school, Nabiki is also not a combatant. Although she always keeps her wits about her, she has herself stated that she's a completely untalented fighter. The only fighting skill she has shown is clobbering Kuno unconscious with a small mallet from behind, while the latter was completely distracted, although Akane also performed the same feat just previously. She has also occasionally manifested a variant of the standardised intimidating battle aura that is recurrently used by various characters for comedic effect, but like Kasumi, and unlike her father, it hasn't been shown as useful for anything else, and is only workable when she's thoroughly mad/furious. She generally ensures that the violence around her finds other targets to occupy its attention, although she miscalculated in tranferring Ranma's engagement to herself, briefly finding herself defenseless when Shampoo and Kodachi decided to simply kill her. Though she is usually shown as unconcerned about other people, and has been outright stated to have 'no maidenly feelings', be 'completely heartless', 'have no maidenly heart', or simply 'not naive', depending on the translation, Nabiki was the one who displayed the most initial interest in Ranma when her father announced the pending arrival of a well-travelled guy. She hoped he was cute and was initially pleased with what she saw. It was not until she learned the pigtailed martial artist was a girl that she changed her mind. She's been portrayed in her general character since her interactions with Kuno a few chapters later. Additional InformationAlthough Nabiki apparently keeps in shape enough to keep a lean figure despite her considerable love of food, at least some of it through light aerobics, she is one of the few prominent cast members without great superhuman physical power. Just need a pic or description of her looks and you're approved!